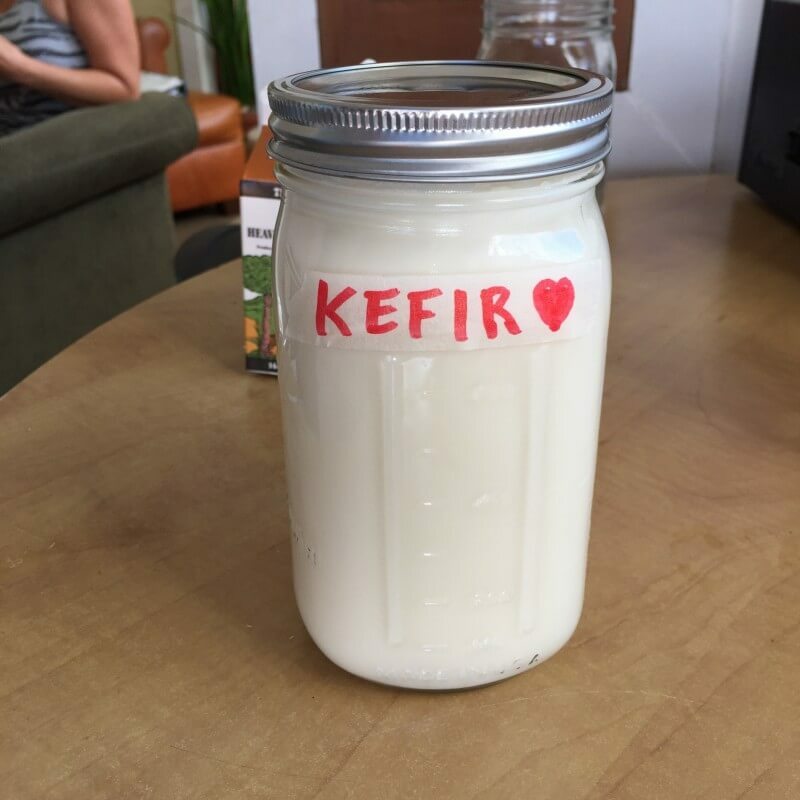 Milk kefir (pronounced keh-FEER, or KEE-fur, I’ve even heard it as KEFF-eer) is made with the help of a colony of bacteria and yeasts (aka a SCOBY) which is organized in clumps or “grains” that resemble cauliflower florets. These helpful microorganisms work fast, consuming the sugars in milk and creating lactic acid, digestive enzymes and of course, lending themselves to create probiotics. 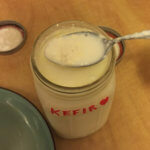 Any type of animal milk lends itself well to making kefir. Try to use whole milk (it makes for a better finished product and keeps the grains fat & happy). As far as how processed the milk is, less is better! 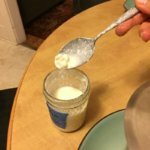 Raw whole milk is fine to use if you have ready access to it, but it is expensive, and the kefir will have to out-compete the good bacteria that are already present in the milk. 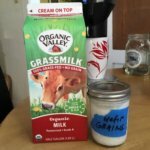 I opt for gently (not UHT or ultra-high-temperature) pasteurized, unhomogenized (also called “cream top” because the cream rises to the top) whole grass-fed organic cow milk. Avoid UHT or ultra-high temperature pasteurized dairy of any kind. Some of the protein and fat molecules are destroyed during this super-heated process, and the bacteria and yeasts do not do well with UHT milk. 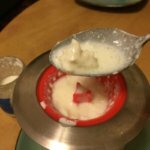 Kefir grains also work well in higher fat milks (i.e. half-and-half or heavy cream) and make delicious sour cream. Looking for high quality Milk Kefir Grains? 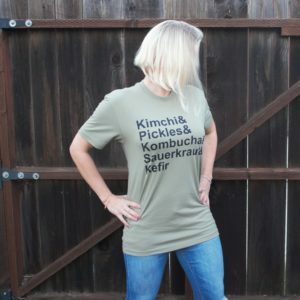 We like these from Kombucha Kamp. Add fresh milk to a clean glass container(s) (one half-gallon jar or two quart-sized jars). 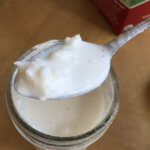 Add kefir grains (half per jar if using two) and 1 ounce finished kefir to jar(s). Stir or shake contents. Cover containers with lid(s) but do not tighten. 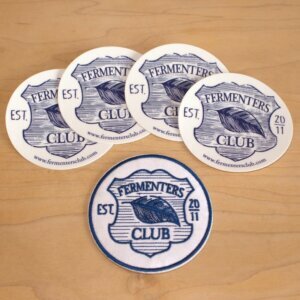 Put in a quiet spot at room temperature and leave undisturbed for 24 hours. After 24 hours, taste. It should have thickened up and may even have broken into solid curds and liquid whey. If it is sour enough, then it is ready to strain. If not, replace lid(s) and check again in a few hours. 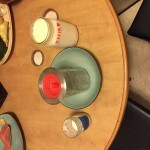 With the lid on tight, shake or stir the kefir so it is smooth and evenly textured. 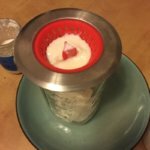 Using a device such as a small wire mesh strainer or a clean sink strainer, strain the kefir into another clean glass container. 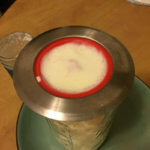 You may need to manually push the curds (and cream if using raw/unhomogenized milk) through the strainer. The grains are rubbery and yellowish and translucent and won't go through the strainer. Scoop out the grains and add them to another jar for storage. After straining everything into containers, add a ¼ cup kefir or fresh milk to the grains jar to keep them happy and healthy. Store kefir and grains in refrigerator. The best quality milk makes the best kefir. Time to strain the grains! 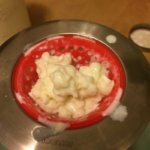 Strain kefir into clean container. Add grains back to their storage jar. Store grains in a small jar. Drink it straight (it is slightly thicker than milk) or use it to make smoothies. I like to make a morning parfait using some fresh fruit and some nuts or seeds. How else can you enjoy it? The possibilities are endless! Use it as a substitute for un-cultured milk in almost any recipe, as a starter for homemade granola; as a base for cultured ice cream, or even in eggnog! Leave us a comment and let us know how YOU like your kefir! 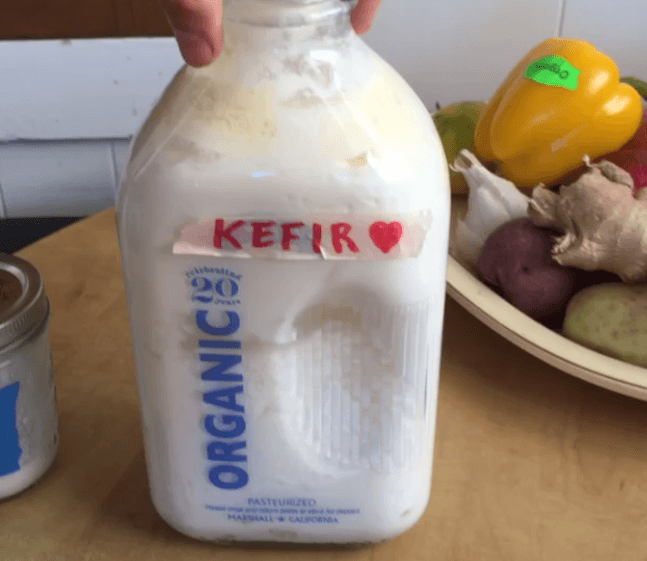 Kefir and water kefir are not the same culture. 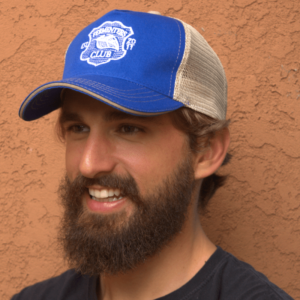 Water kefir (aka tibicos) got its name because of the SCOBY’s resemblance to kefir. The cultures are different and are not readily interchangeable. 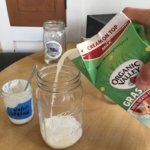 You won’t have much luck using water kefir grains in milk, nor vice versa.